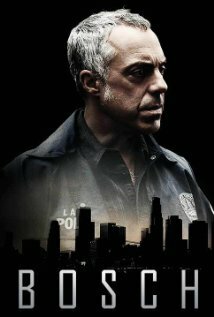 Based on Michael Connelly’s best-selling book series, Bosch (Titus Welliver), an LAPD homicide detective works to solve the murder of a 13-year-old boy while standing trial in federal court for the murder of a serial killer. Okay, the “on TV” part of my title might be a little deceiving, but I didn’t know how else to phrase it. Bosch is one of Amazon’s original tv series pilots. I watched it on my Kindle, mostly because we have an old tv and no x-box or whatever. I like Bosch, so I’m a little biased. I’ve listened to several of the books in the series, including one that this pilot is partly based on. The concept isn’t original. You’ve got a middle-aged cop with a tendency to play by his own rules. While he’s dealing with a civil trial for shooting a possible serial killer he picks up the call when a bone is found. Turns out the bone belongs to an abused 13 year-old boy. I have to say that the show worked perfectly with how I picture Bosch and the people around him. It even captured his gorgeous house in the hills. Welliver pulled of Bosch’s manner and attitude well, which was important to me as a fan of the books. It’s hard to say much about the plot since this was more of a set up for what’s to come. The trial has started and the skeleton has been found, but nothing’s been resolved yet. If I weren’t familiar with the books, though, I might have been disappointed. It’s another police drama, and there are already a lot of them. It’s not action-filled, more character driven, which I appreciated but the general audience may have found a little slow. I hope we get a chance to see more. This could be a great series. ….I will check this out…was it Amazon Instant Video? Yeah, and it’s free to watch even without Amazon Prime. I didn’t know I could watch this for free. I need to check it out! Sounds like something I would like I didn’t know Amazon was making TV shows. Sounds good. How do you access it? Download from Amazon? I didn’t know Amazon was doing tv shows now. I’ll have to tell my mom, she hasa Kindle and loves Bosch.